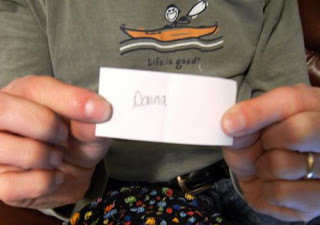 Here is my second week's Give-Away for October's Breast Cancer Awarness Month. 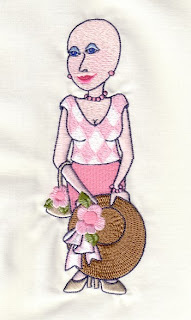 Each Sunday I will give away another sweet embroidered lady block from the "On the Mend" breast cancer collection designed by Loralie Designs. Check back often and see what's new. All you need to do is become a follower, leave me a comment on how you would use this sweet block and sign up for my store newsletter. It's that easy. 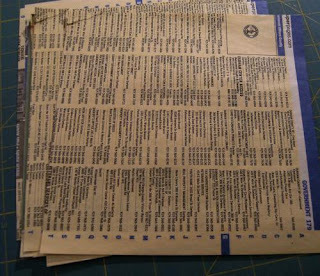 Just fill out the form on the right column. Tell your friends too!! Tonight's winner is JVC Scout Mom! She gets the cute "Hats Off to You" embroidered block. 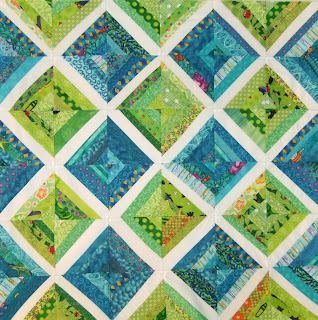 Here is my version of Cluck Cluck Sew's tutorial on the Double Hourglass quilt!! I gotta make a few more. I think I'll use some Amy Butler fabrics in one, some lime greens in another, and maybe an Aunt Grace too!!! 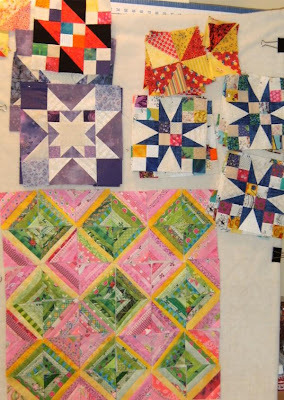 These are perfect donation quilts and I had some much fun making it!! 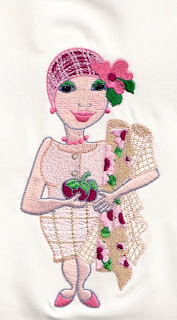 This Week it is "Hats off to You"
Don't you just love the fun and funky look of Loralie Embroidery designs? 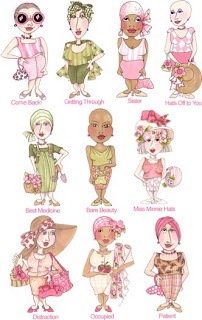 I think these ladies from the "On the Mend" collection are adorable. 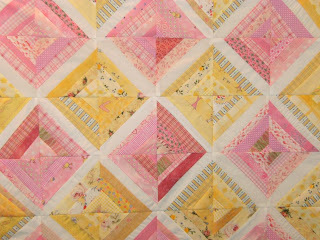 I have had many customers make a quilt out of the panel that is for sale in my store. I would love to put a few samples in my gallery section. So if any of my customers are reading this, please email me and let's upload your special project. 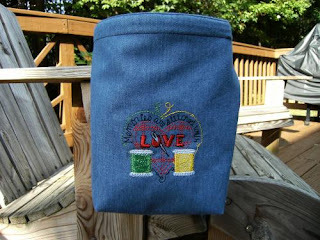 Each week I will be giving one of these special embroidered beauties away. It will be a surprise which one you get. 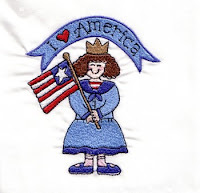 They are machine embroidered by me on my super terrific Happy Embroidery machine. The square is about 12 x 12. Giving you plenty to room to square it up to any size you need for your project. 1. Follow me on Blogger. 2. 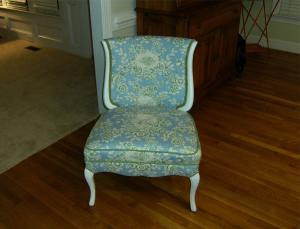 Leave a comment and tell me how you would use this beauty. 3. Sign up for my store newsletter. Be sure to leave me your email address. You can privately email me if you do not want your email shown. Our just use a partial email as a code and I can figure it out. Don't forget to sign up at the right side for the store newsletter. It's a painless process. You need to do all three steps. Thanks to everyone who posted a comment, took a peek at my store, and signed up for my newsletter. I look forward to sharing more with you all. 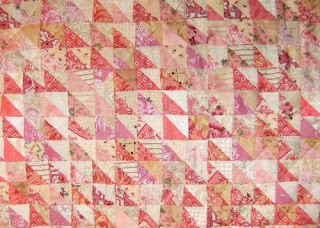 Tomorrow I will post of a picture of my Double Hour Glass quilt from the Cluck Cluck Sew Tutorial. October is Breast Cancer Awareness Month. 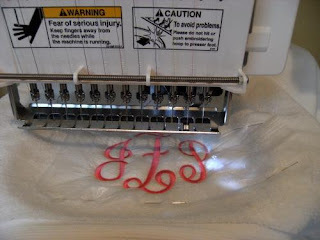 I am putting together another contest to win this Loralie Embroidered Breast Cancer block. Isn't she neat? Just leave a comment and sign up for my store newsletter. While I was making my Southern Spin quilt, I sewed an extra seam on the other side of my drawn line and kept these little goodies in a plastic strawberry container forever. I knew I'd use them someday. There are really tiny. Just one inch with the seam allowance. 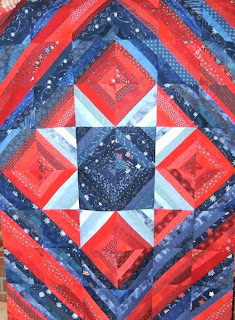 First I made this quilt called Southern Spin. 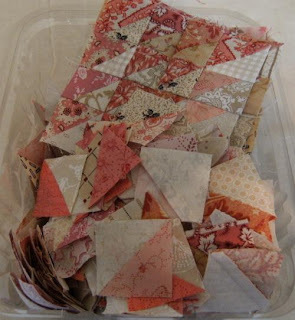 The pattern called for lots of half-square triangles and that meant lots of waste. I just couldn't throw these sweet pink little triangles away. I knew I would use them someday. 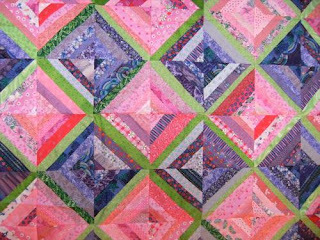 That's when I found about Waste Triangle quilts. Don't be left out. Sign up for this great Give-Away! All you have to do is sign up for my store newsletter and leave me a comment. Signing up is easy. Just fill out your email address on the subscribe form. It's on the right side column. 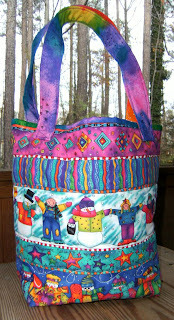 You must leave a comment to be eligible to win this cute tote bag. A lucky winner will be picked October 4th. Checkout my new store too. 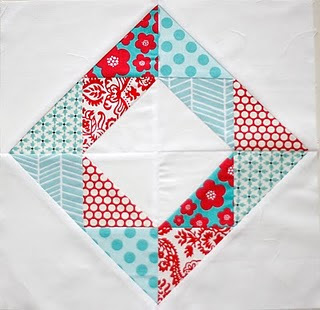 I've got lots of great goodies, promotions and free quilt patterns too!! 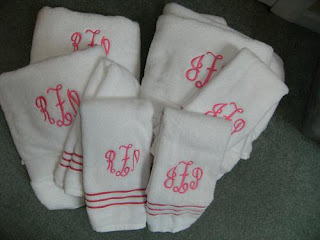 There's something about my sorority girls and their fluffy white monogrammed towels. Getting a lot done today. I love retreats!! First on the to do list was send some goodies and letters to my soldiers who are deployed. Thanks to Susan who recommended the Soldier's Angels Writing Team to me. I have a few guys and one gal that I write to. I sent them some sweet treats today. Guess what I had for breakfast? Hot Tamales. It didn't fit in my box, so I ate them. I'm bad. 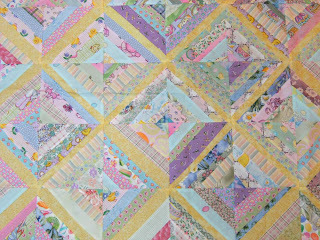 Last night I finished my Thread Catcher or Quilter's Catch All. 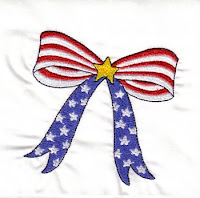 My friend Carol designed the pattern. I might put some kits up for sale in my store. Today I attacked the massive stack of 180 blocks for my Trail Mix. I have 9 rows sewn together and I think I have 9 more to go. I am not really liking the thing. But I will finish it up and then decide later. All right, I am not going blind. Just a massive inflammation from bad mascara. Ladies, throw out that old stuff you've been hanging on to and get a new mascara wand. 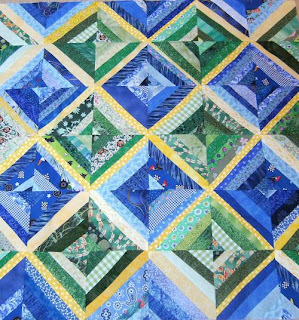 Now back to quilty things. 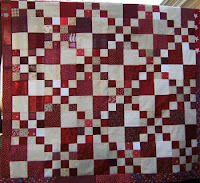 I finished a Quilter's Catch All but ran short on time to take a photo of it in the daylight. Come on back tomorrow and take a peek. 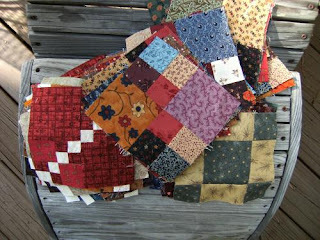 I started putting my blocks together for my Trail Mix Quilt. There are 180 blocks. 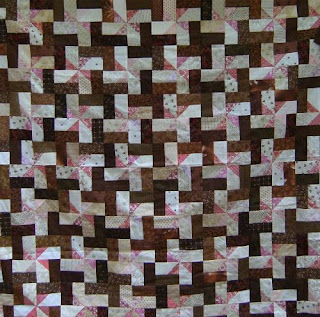 Some of the teenie tiny squares are cut 1 1/4 inch before seam allowances. So now that all the blocks are done, I am starting to put them together. Quilt Police don't come here. 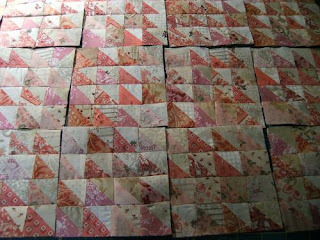 With teenie tiny squares finished at 3/4 inch, I need to tell you that I am not the most accurate 1/4 inch seam sewer. I am a having a pretty neat Give-Away at this time. You can have a chance to win this adorable KP Kids Halloween Tote bag just by signing up for my newsletter. It can be great for your kids to haul in their halloween treats, you can also use it for yourself and make quite a fashion statement. Drawing will be held on October 4, 2009. It's easy. Just sign up for my newsletter and you may be the lucky one. 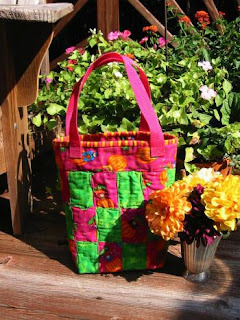 Want this cute KP Kids cute quilted tote bag? Sign up for my newsletter and get great notices about sales, freebies and special events at my store. Okay Ladies, I am revved up and ready to start retreating all weekend. But I woke up with pink eye this morning. 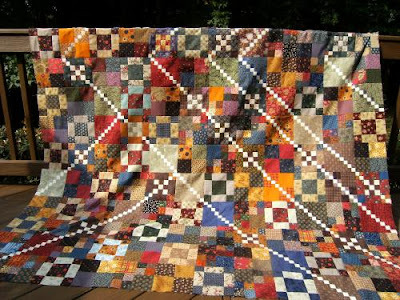 Did you ever see a “one-eyed” quilter? It’s not pretty. 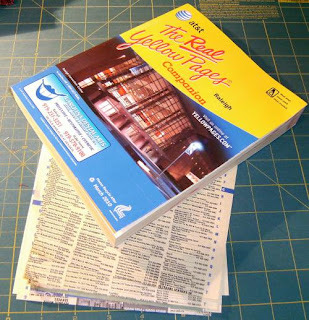 Now that means a bit of time away from my sewing room and a trip to my eye doctor. WHAAA!!! I got lots of new things ready to put in my store ready yesterday and I got all of my give-aways ready for my blog too. I guess I will up load all of that after I know what exactly is going on with my eye. We are not working for a whole 4 days. YIPPEE. I’ll check in later. Can We Just Say No? 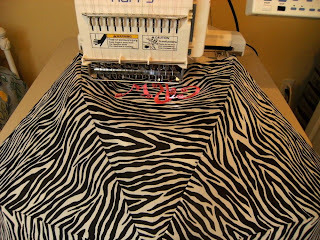 Isn't it true that you always get asked from someone who knows you sew to help them with a sewing project? "It's just a simple little task" they say. Even my daughter is to blame for these type of questions. So how could I say "No"? I was planning to participate in my own little quilting retreat and finally get something done for myself. 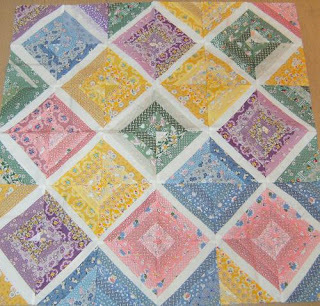 I have been in a quilting slump this summer and I finally seemed to get back into my groove when this lovely project came into the garage from a Craig's List find. 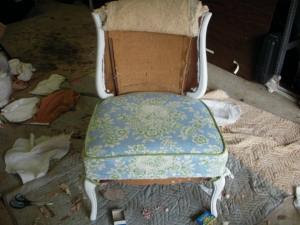 At first we started attacking this lovely chair in the garage and then realized that it was probably 100 degrees in there. We decided to move it into the house with the air conditioning.... What a brilliant idea. 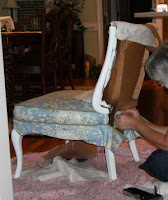 After ripping the chair apart from the seams very carefully, we used the old velvet that was on the original chair as our pattern. 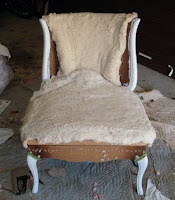 We actually are quite impressed with ourselves how this messy little chair turned out. 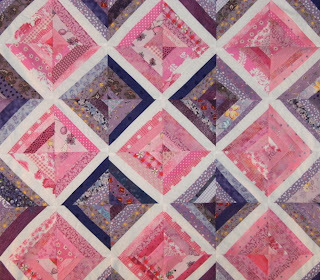 I have even been in a slump this summer without quilting much. But today I am on a roll. It will be interesting to see how much I accomplish this weekend. I'll post my progress Sunday night on my blog. You can take a peek. I usually post every Sunday night. 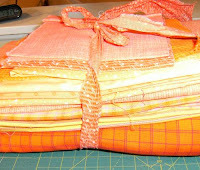 This a nice bundle of peach, orange and pink fabrics were all bundled up my stash. 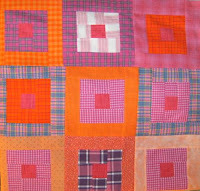 I knew that I wanted to make an orange and pink quilt someday. So finally this weekend I finished it. 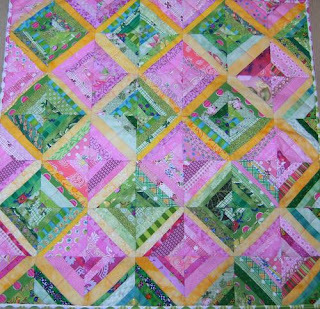 I decided to make an Easy Log Cabin quilt. I love this pattern. It's super fast and anything goes!! 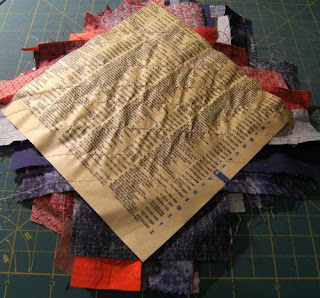 I used Marti Michell's Log Cabin ruler to cut out all my strips. 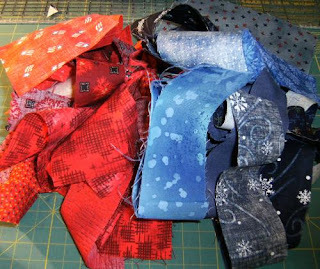 Maybe you should also know that I have a problem with cutting into fat quarter bundles that I bought or have organized in my sewing room. I love seeing them all tied together so color coordinated and perfect. It's hard to use them. I bet I'm not the only one out there who "Just Can't Cut it". Drop me a quick comment about how to "get over it". I love The Fresh Market!! Yesterday, The Fresh Market had a special event outside the front of the store. They were grilling peaches and giving away samples of peach cobbler. Ohh, it was so Yummy! I bought a huge bag. All my kids came home for the weekend and now all the peaches gone! 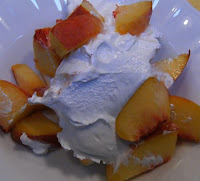 We just finished our sliced peaches and Cool Whip on top of Angel Food Cake for dessert. To me, this is the best part of summer. I love making all kinds of peach desserts. I guess I need to go back and get another bag full. 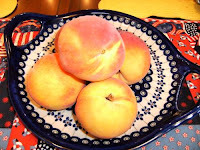 I actually "googled" peaches and found this neat blog about peaches.